This entry was posted in Uncategorized on April 30, 2012 by ddrkirbyisq. I already knew what I wanted to do before compo even started, and it had nothing to do with the theme: remix A-zu-ra and starla’s entries from last week. And I did exactly that. And it turned out amazing. One of my best OHCs, up there along with The Ecstasy of Life and Pixel by Pixel. There’s actually a triangle bass part that got muted somehow that’s supposed to play at 2:24, but other than that I can’t really say that I would have changed anything, really. The main A-zu-ra melody line is vaguely reminiscent of a Willrock-style solo lead somehow, which is cool. I think it’s the guitar solo-like riff at 1:26 that really does it. Yeah. This one was really fun. For every hour of class that I go to, I could be doing something else. Many times, there isn’t that much impact on my grade, or my life. At the beginning of the quarter, before CS194 lectures stopped, I had 2.5 hours of C348b, 2.5 hours of CS244, and 2.5 hours of CS194 every week (they each met TuesThurs). That’s 7.5 hours in total each week. Yeah, those all got written over a combined sum of ~7 hours. Think about the value of either option. …the latter of which has already touched many people’s lives. This is why I’ve started becoming fond of the ISFJ description over the Enneagram 2 one. Besides Myers-Briggs just being more well known, ISFJ provides more of a broad picture of many things, whereas the Enneagram diagnosis is more focused on the “core” need to help and be loved. I will admit that the Enneagram descriptions give more detail into what happens when I become unhealthy versus happy. But anyways, I definitely have that sort of small observant memory recall. In fact, when I met my other ISFJ, I told her how I remembered this one time we were getting into someone’s car and she sort of turned to me and softly asked, “wait, should we put our things in the trunk…?”. After that she just dropped it and got in without saying anything, which is why that was one of those moments when I realized, “wow, this person is really like me”. And I still remember that moment. Similarly, I noticed all of the little things that my onee-chan was doing today when no one was watching, like picking up litter and such. And I was also keeping an eye on K throughout a good portion of the night. It’s not like I watch -everybody- all the time–for instance, I didn’t notice when E left–but I notice a lot of these things, because I look out for people. Also, I know I’ve already gone over this in a previous post, but =dude=. Helllo CS? Not only does this relate to the fact that I skip all my lectures and stuff, but this also speaks to the fact that my favorite CS class was CS107 and basically all of the higher level courses have been “a chore” and impractical, whereas game programming is extremely fun for me because, well, it’s practical, tangible, and important. My onee-chan always comments on this! Me and my onee-chan were definitely talking about the “firm desire to believe the best” tonight…I’m also really happy because I know that sometimes (not always! but sometimes!) I really am able to bring out the best in others. While their work ethic is high on the ISFJ priority list, their families are the centers of their lives. ISFJs are extremely warm and demonstrative within the family circle–and often possessive of their loved ones, as well. When these include Es who want to socialize with the rest of the world, or self-contained ITs, the ISFJ must learn to adjust to these behaviors and not interpret them as rejection. Being SJs, they place a strong emphasis on conventional behavior (although, unlike STJs, they are usually as concerned with being “nice” as with strict propriety); if any of their nearest and dearest depart from the straight-and-narrow, it causes the ISFJ major embarrassment: the closer the relationship and the more public the act, the more intense the embarrassment (a fact which many of their teenage children take gleeful advantage of). It doesn’t really matter whether or not the whole personality classification system is “right” or not–you just can’t argue that it’s extremely useful simply by virtue of conveying an obscenely accurate picture of my persona. This entry was posted in Uncategorized on April 28, 2012 by ddrkirbyisq. I need a better emoticon for sadness. =( is more like frowny. :( is the same. =/ is like “oh no…that’s terrible”, and :/ is just weird, and good gosh I’m not going to use :-/, that’s just dated. T.T and T_T are okay but they’re like obnoxiously sad. >.< and >_< are more like eek oof. -_- is more like “gimme a break”. I guess there’s not really anything. .(-.-). maybe? -.- isn’t that bad, but still…I don’t think any are really good. This entry was posted in Uncategorized on April 27, 2012 by ddrkirbyisq. Which is also extremely beautiful, in its own way. But this post isn’t about FEZ. I don’t even own FEZ, though the more I learn about it the more I am convinced that I must play it, along with Mega Man 9 and Mega Man 10 and SSX4, etc. But anyways, Sword and Sworcery is a pretty interesting game. It’s definitely an artistic game, one that you wouldn’t play for the “raw pure gameplay” like you would for Tetris: The Grand Master. It has a certain interesting aesthetic throughout, but I think its biggest achievement is simply how amazing it manages to look. I know we’re all supposed to be kind of over this “games as art” thing and we shouldn’t really be nudging all of our friends and saying “look look! 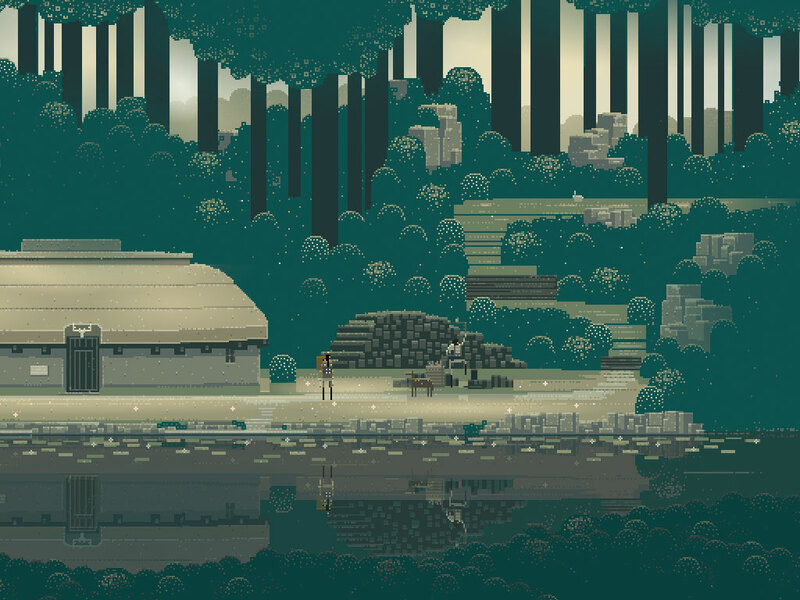 games are art!” because that battle is either already won or too old and pointless to win anymore, but…still, part of me feels a certain sense of satisfaction knowing that if I showed a screenshot of Sword and Sworcery to someone, I could point it out and say, look. Isn’t this beautiful? Sword and Sorcery is out on both iOS and Steam, so you don’t really have that many excuses not to get it. This entry was posted in Uncategorized on April 25, 2012 by ddrkirbyisq.